Jordin Phipps is a third grade student in Texas. She is early admitted by University of North Texas. And she can get a $10,000 scholarship. She is surprised. She is early admitted by a university because of a video. The video is about her and her roommates. They repeat some motivational phrases in the video. "I am smart. I am a leader. I will succeed." Jordin says in the video. Jordina's mom, Nichole Smith, graduates from University of North Texas. She shares the video on the university's Facebook page. Then she receives a call from school officials. Her mother says that she is actually a shy child. 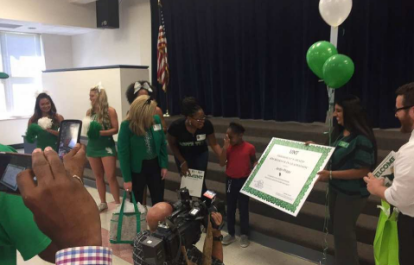 The attention from University of North Texas will inspire her daughter. 1. Jordin Phipps was a ____ grade student in Texas. 2. Jordin Phipps could get a ____ scholarship. 3. What did Jordina's mom share on the university's Facebook page? 5. Jordin Phipps is actually a ____ girl.